After this week’s announcement in the Chancellor’s Autumn Spending Review that investors will have to pay an additional 3% in stamp duty on B2L properties and second homes (from £40,000 upwards) from April 2016 (BBC News) the immediate reaction is that this may signal the beginning of the end for UK B2L. But is it too soon to be writing the B2L obituary? Transactions under £40,000 do not require a tax return to be filed with HMRC and are not subject to the higher rates. What does this mean for B2L investors in numbers? The graph below shows the cost of stamp duty for B2L investors on property values up to £1.5m today, from April 2016 onwards and before December 2014 (when the last changes to stamp duty were implemented), which highlights a few key points. The impact of the new levy increases relative to the value of the property (comparing the position today to post April 2016). For example, at £125,000 stamp duty payable increases by £2,550 (from £0 to £2,550), which represents 2.0% of the property value. This steadily increases as the property price increases. So at £1.5m stamp duty payable increases by £43,800 (from £93,750 to £137,550), which represents 2.9% of the property value. Stamp duty will be payable on properties purchased below £125,000 for the first time since March 2006 when the threshold was raised from £60,000 to £125,000. Stamp duty payable from April 2016 will be higher at all prices than it would have been before December 2014 (with the exception of properties below £40,000). 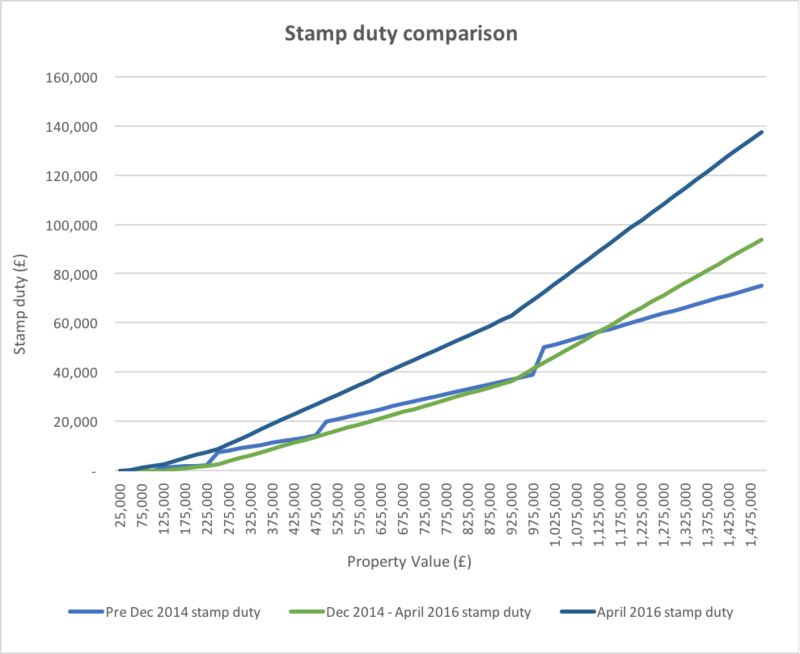 But, the increase in stamp duty is lowest when compared to the old, pre December 2014 thresholds. For example at a property value of £250,000, stamp duty from April 2016 (£8,800) is only £1,300 higher than the amount payable before December 2014 (£7,500), which represents 0.5% of the property value. Whereas, at a property value of £1.5m, the increase in stamp duty, compared to before December 2014, represents 4.2% of the value of the property. Which equates to £62,550 (£75,000 before December 2014 and £137,550 after April 2016). This increases further to 5.6% at just under £2.0m. What does this mean for B2L investors in practise? The Institute for Fiscal Studies has predicted a “rush” in sales driven by B2L investors seeking to complete purchases before stamp duty rises in April (Source: Telegraph). However, many are predicting a reduction in sales in the longer term. The Office for Budget Responsibility has predicted that the stamp duty changes will lead to reduction in property sales of 3% in 2016 and 2% each year from 2017 to 2020. Based on the analysis above, it follows that properties in the £1m+ price range may see a disproportionate fall in sales. Properties at this level will see the highest relative change in stamp duty as a percentage of the property value and this follows the previous increase in stamp duty in 2014, which is seen as the most significant reason behind the slow down in the property market at that level. 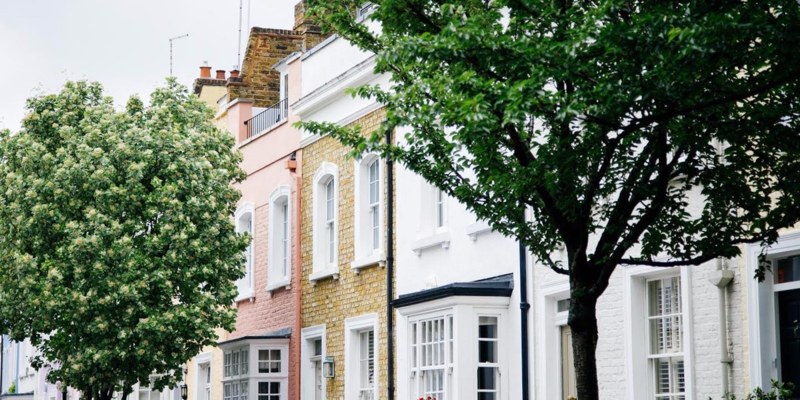 Given the highest concentration of £1m+ properties are located in London and the South East, it also follows that these areas may see the highest fall in sales. These areas have already been significantly impacted by increases in stamp duty, the changes announced earlier in the year that prevents landlords deducting mortgage interest from rental profits at the higher rate of tax and a general fall in rental yields as rents have failed to keep pace with property price inflation. This news also follows recent reports from both UBS (Source: Guardian) and Deutsche Bank (Source: City AM) that warned of a future fall in property prices in the capital. The same analysis above also suggests that the reverse is true at the lower end of the market where the impact of the change in stamp duty is lower relative to the property value and particularly when compared to the cost of stamp duty before December 2014. As a result, properties at this end of the market, in highly populated areas away from the South East, where rental yields are typically higher, may see a lower reduction in sales as a result of the stamp duty change. Prior to this week’s announcement Savills latest market report predicted that UK house prices would rise by an average of 5% in 2016 and then a more modest 2.5% to 3% a year to 2020 with the lower growth attributed to the impact of tighter mortgage criteria and higher interest rates (Source: Savills). However, it is unclear how these forecasts would be affected by the changes. It may be reasonable to assume that irrespective of demand that the market will see a price correction, (similar to the prime London property market reaction) as investors price in the added cost of stamp duty, either to maintain target returns or as a result of affordability. Assuming some private landlords are pushed out of the market by owner occupiers (potentially armed with a 40% interest free loan from Uncle George). This will have the affect of reducing the supply of rental properties, which in turn may drive up rental prices and yields for those landlords that do remain. It should be noted when considering the impact of the new levy that landlords can offset the cost of stamp duty against capital gains tax due on disposal and therefore, assuming a profit is generated above an individual’s capital allowance, landlords will be able to reduce their capital gains tax due at a current rate of 18% or 28%, which potentially partially offsets the impact in the long term. Any announcement on a change to a tax rule is usually followed by advice on how to avoid paying it and this case was no different, with advisors’ suggestion the new levy may be avoided by splitting ownership of property with a spouse/partner, by moving into a property to avoid it being classified as an investment and acquiring a property through a company. It is also not clear on how the new levy will be applied to foreign investors. However, it is also not clear that any of these methods are, or will remain viable and will materially affect the impact of the stamp duty changes. Overall, it appears highly likely that there will be a short term rise in demand as investors seek to complete property purchases before April 2016. In the longer term, against a backdrop of reduced property price growth it is highly likely that this week’s announcement will put off some would be investors and the market will see a price correction as others invest more conservatively. However, it feels too soon to write of the whole B2L market. A critical undersupply of property, continued population growth, a forecast low interest rate environment and potential growth in rental yields for good quality rental properties all suggest that UK property will remain an attractive investment for many. This article was written by Homegrown. Homegrown is a UK property crowdfunding platform that allows everyday investors to invest in high quality property development opportunities with leading developers, that were previously reserved for institutions and professional investors (min £500 investment). Please see our website at homegrown.co.uk for more information.